Building on my earlier blogs looking at basic conditional formatting and data bars in Excel, this short blog will focus on the cell icon options within Icon Sets. This will create a new rule in which the top 33% (based on the quantity of cells you have selected) have the green icon, the middle third the yellow, and the bottom third the red icon. 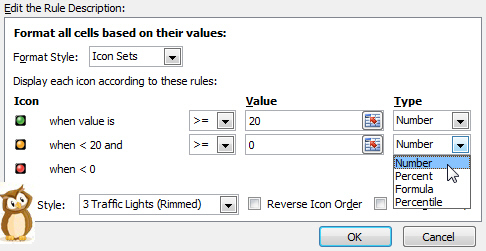 Once you have made the changes, click on OK on the Edit Rule... dialog box, then click OK or Apply on the Conditional Formatting dialog box and your edited rule should now be in place! The finished list with 'Icon Sets' replacing the old-fashioned conditional formatting! Do remember that the fancy new conditional formatting options won't work in earlier versions of Excel, and they'll be removed if you have to save the file in Excel 97 - 2003 format!